At first glance the Essonville Road Cut looked much like many others in the area – gnawed upon by rockhounds and strewn with shards of calcite and sand. 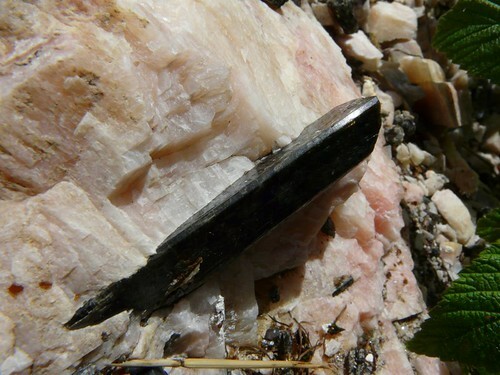 Most immediately obvious were the huge black crystals that protruded from the calcite – a dyke that is theorized to run off into a southerly direction onto private property. A sign on the fence behind the cutting advertises “Rockhound Eco-tours”. A rockhound eco-tour? It almost seemed contradictory. “You’re a rockhound?” I asked the fellow crossing the road from the pickup he had parked on the opposite shoulder – “You might say that”, I was told with a grin. “I am more a prospector and I operate the eco-tours – like to show the minerals on my property but we prefer not to set pick or hammer to them. We like to think of ourselves more as stewards”. “Stewards?” “Yeah, caring for the land. I know it sounds hokey, but I think we were meant to have our property – to look after it. Collecting can be destructive”. I kind of edge my rock hammer around behind me. “Is there a problem with us collecting here I ask? Nah, its public land. Place is already trashed with all the blasting”. In reverent terms Mark explained, what had formed in the cutting was Fluor-richterite. You will notice that some of the crystals have a metallic sheen – kind of stained by an iridescence, Its only a skin of goethite, beneath it is still fluor-richterite, one of the few minerals that can really be called “totally Canadian”. It was only distinguished from hornblende and recognized as a separate species in 1976”. “So, in truth, you would have a hard time distinguishing between the two?” “Not really” my eco-teacher told me. “They are both amphiboles and they form a solid solution series, but fluor-richterite has a scaly white surface and it forms in prisms that are longer and thinner than those of hornblende”. “Do you sell any specimens?” I ask hopefully. “How can you put a dollar value on them?” I am chastised. As fortune would have it, I found myself in the company of Lee Clark later that afternoon. 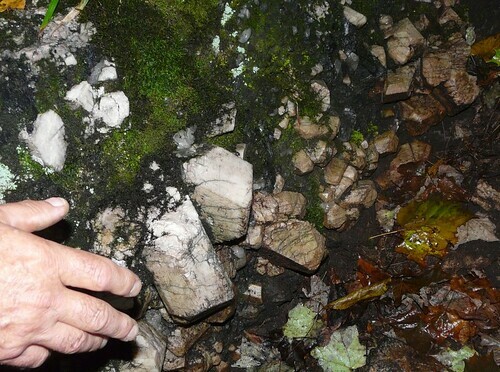 Having seen the township’s blasting Lee had asked for the debris to be dumped beside his barn; he had scooped the lion’s share – enormous boulders with fluor-richterite spines and as Lee pointed out hexagonally appearing prisms that cleave away in flakes. “phlogopite mica; they used it for windows in the old wood stoves. Having weathered out of the calcite there were doubly terminated prisms lying amongst shards and unusually shaped prisms that appeared fully formed on the one edge and flattened on the other. I was in the process of trying to decide what unusual growth condition had so stunted the crystals when Lee apparently read my thoughts “The prisms frequently cleave down their center,” he slipped me a smaller perfectly formed specimen that he had been carrying in his pocket. “It’s my worry stone” he explained, “You take it; folks down south have greater use for that than I”. P1020064, originally uploaded by Mic2006. Check out these orthoclase feldspar crystals – or at least my guide told me they were orthoclase crystals. I have not had the chance to verify this. I met an interesting gent who runs ecotours for mineral collectors. His philosophy is that the minerals should remain in-situ so that future generations can enjoy them. I had been picking away at a road cutting when my host approached me to introduce himself. Are you a rockhound? I asked. I have since learned that Mark is more focused on preservation than collecting – which is good. It would be a crime to whack away at this beautiful specimens and turn them into dusty old rocks in someone’s basement. I will be visiting Mark again and if he is agreeable I will display some of his other amazing mineral wonders – all “in-situ” “As god has made them”. On Mark’s tour I saw huge horneblende crystals, long thin spines of fluor – richterite and plenty of red zircon. Both the fluor – richterite and hornblende are amphiboles though they can be quite easily distinguished apart by the more squat and blocky nature of the hornblende. Fluor – richterite has a diamond shaped cross-section and so it is simply distinguished from a pyroxene family member which tends to have crystal angles at close to 90 degrees.